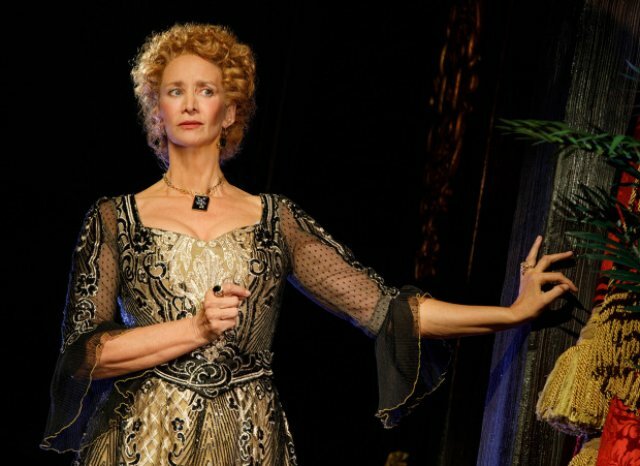 Janet McTeer doesn’t appear enough on Broadway. This gifted actress always wins praise – whether it was as Nora in A Doll’s House, or in God of Carnage, Mary Stuart or other works. It’s great to have her playing famed actress Sarah Bernhardt. Bernhardt/Hamlet is a new play by Theresa Rebeck that tries to capture both Bernhardt and comment on our modern era. Sometimes it works and sometimes it doesn’t. But the joy is the splendid cast led by McTeer who captures all of what one suspect is Bernhardt’s mercurial temperament and artistic extravagance. It is a delight to watch an actress play an actress who was known for her acting, her outsized persona and her lavish and unconventional lifestyle. Sarah Bernhardt and Eleanor Duse were the two great theatrical stars of the 19th century and therefore, of course, they were rivals. Bernhardt started at the Comédie Française, she played Camille well into her middle age, toured the world and believed in carpe diem. She also was a renegade for the times. She left Comédie Française when she realized they were making huge amounts of money from her performances but paying her little. She also had the audacity of running her own company (and directing) as well as playing male roles. Bernhardt lived into the 1920s and we have motion pictures (silent, of course) of her. But Rebeck has wisely not tried to give us her whole life: she sets her play in the 1897; Bernhardt is producing Shakespeare’s Hamlet with herself in the title role. It’s to be performed at a large theater and the financial risk is also huge. As usual she needs money. Just one problem emerges during rehearsals – she absolutely dislikes and cannot understand the title character. She views Hamlet as a man of inaction which she finds annoying and impenetrable. A second problem is that she is having difficulty with the verse. So, she does what any diva might: she commissions a playwright to rewrite the play into prose and to make Hamlet more decisive. That’s the background as we see Bernhardt with her current lover – the playwright Rostand and members of her company. She has persuaded (bullied?) Rostand, who had yet to write Cyrano de Bergerac, to work on the adaptation. He fails but two other playwrights actually do create a version that she performed. The plays action centers on the rehearsals, her dislike of Hamlet, her relationship with Rostand and his wife’s action to derail it. So while program notes say that the play “explores the sacrifices necessary to shatter centuries of tradition, take on the untouchable and command one’s own legacy,” the play itself does not achieve those lofty goals. It is more about the outsized ego of a celebrity actress who is determined to do whatever she wants to do with a character and a play. For some reason, Rebeck has felt it necessary to include a scene from Cyrano which starred one of Bernhardt’s company in the title role. The purpose of this scene is puzzling. Besides McTeer, fine performances are given by Dylan Baker as the actor Costant Coquelin, Jason Butler Harner as Rostand, and Matthew Saldivar as the artist Alphonse Mucha who designed the famous art deco posters for her shows. Only Ito Aghayere as Rostand’s wife seems to be in a different production. The rotating set by Beowulf Boritt is terrific as are the costumes by Toni-Leslie James. Bradley King’s lighting is also very good. Director Moritz von Stuelpnagel’s work melds the various parts of the plot together. But the reality is that this a play that could be tightened to be more effective. It seems to lose focus between act one and two.